Raised in a wealthy Chinese family, Lin was educated at St. Mary’s College in London before marrying Liang Sicheng in 1924. Liang Sicheng was the son of another well-to-do Chinese family. His father, a government official before becoming a scholar and an educator, began a social and literary movement aimed at bringing modern Western thought to China. The young couple came to the University of Pennsylvania in 1924 to study architecture under Paul Cret. 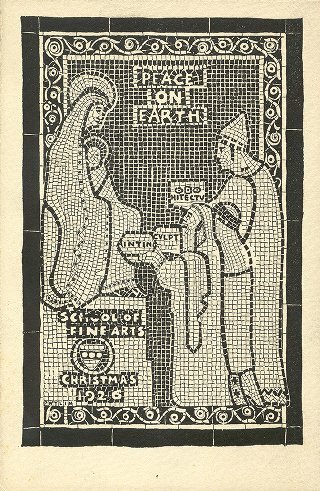 During her tenure as a student, Lin served as a part-time instructor in Penn’s School of Design from 1926 to 1927. This particular card was the chosen winner from a student competition. Lin went on to do graduate work in design at Yale University before returning to China. Back in China, Lin helped to establish the Architectural Department of Northeastern University in Shenyang and taught there briefly. She designed only a few buildings, including a railroad station in Jilin. During the 1930s she and her husband traveled in the Chinese provinces to study and record architectural relics. After World War II, Lin and her husband worked on the design of the National Emblem of the People’s Republic of China as well as the monument to the people’s heroes in Tiananmen Square. 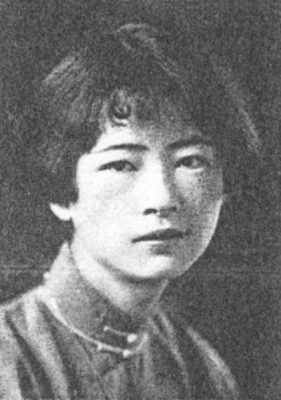 Lin also wrote poems, essays, short stories and plays, translated English works into Chinese, and with her husband, a history of Chinese architecture. She died of tuberculosis in 1955. Lin has been described as the first female architect in China; she is the aunt of Maya Lin, the architect of the Vietnam Veterans Memorial on the Mall in Washington, D.C.